Hello everyone, today’s update is a quick one, because the project I want to show you is a quick one too. This weekend I washed my windows! Amazing yeah, I know. And if you have been here before you’ll know what that means…. Windows got washed, so a new wreath was hung. I made a Spring wreath for my front door. Just until two weeks ago I still had my Christmas wreath on my door. Since I only used natural green colors in that wreath, and no traditional Christmas colors or decorations I convinced myself it could pass for a winter wreath too. All those natural greens I put in there had started loosing their needles like crazy. Every time I opened the door to someone an avalanche of pin needles would fall on the floor. I removed the wreath two weeks ago and then I just had an empty hook in the middle of the glass panel. Not much of an improvement in the decorations department, but at last I didn’t have to vacuum all the time. So this weekend I decided my windows needed to be washed pretty badly and it was time for a little wreath update. I found these branches with spring flowers for next to nothing, so I bought myself three of those, tore all the flowers with their little stems off of the main stem and pushed them into a twig wreath. That is the beauty of twig wreaths. You can just push things in and they will hook themselves solid. No need for wire or anything. Quickest way to make a wreath any day. 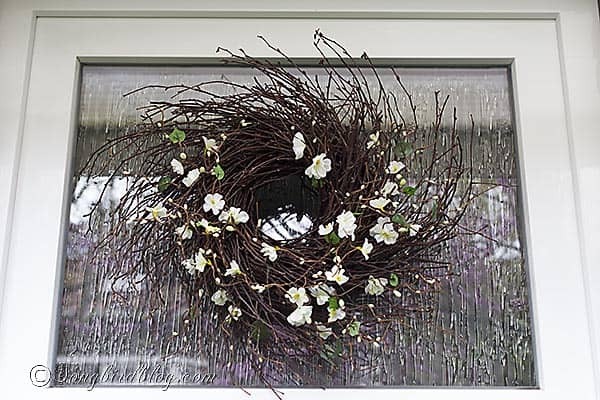 The front of the house has moved into Spring, a Spring wreath is hanging on the door and I don’t need to vacuum after welcoming someone into our home. Life is good! What I want to know is how is your wreath hanging on your door??? I don’t see a hanger…?? If it makes you feel any better, I’ve had the same one up since 2007. My mother-in-law brought it to the hospital when I had surgery. It got so many compliments at the hospital and still does. Good job Mother-in-law!